It was only fitting on this Veterans Day that the Octagon officially announce their “UFC Fight Night 23: Fight for the Troops 2” event on January 22nd in Fort Hood, Texas. As expected, a spectacular lightweight scrap between Kenny Florian vs. Evan Dunham will headline the freebie fight card. This live special will raise funds for the brave men and women in the United States Armed Forces with traumatic brain injuries. 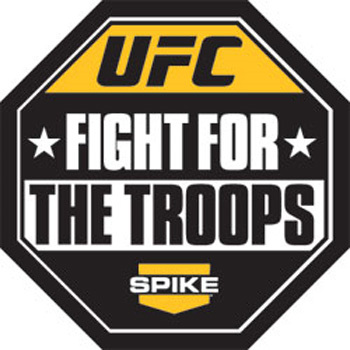 Information about ways to donate can be found online at www.fightforthetroops.com, along with UFC.com and Spike.com. This is the second “Fight for the Troops” show, the first taking place in Fayetteville, North Carolina in December 2008 that raised over $4 million dollars. The Intrepid Fallen Heroes Fund (IFHF) provides assistance to our nation’s military heroes who have been critically injured in the performance of their duty, and their families. Florian holds a respectable 13-5 mark, but was accused by White of choking in his last outing against Gray Maynard. With a shot at the 155-pound crown on the line, the Bostonian laid an absolute egg in front of his hometown for a unanimous decision loss at UFC 118. White also had a lot to say about Dunham after his last contest. Only this time, the brash promoter unleashed his venom on two of the three judges sitting cage-side at UFC 119. Although it appeared the youngster had done enough against former champ Sean Sherk to maintain his undefeated status, Dunham was handed a highly controversial split decision defeat instead. Spike TV will broadcast the event live beginning at 9PM ET/6PM PT.